Soay are easy keepers and easy lambers. These lightfooted, excellent foragers improve Small sheep for small acreage ► pastures while grazing. Adult ewes weigh 50 lbs, rams 75 lbs. They are thrifty, shy, curious, and kid-friendly. Soay sheep come from the remote islands of Soay and Hirta, sixty miles off the northwest coast of Scotland, where they have survived as a stranded, isolated population for thousands of years, completely unmanaged by man. They are thought to have descended from the flocks of primitive Bronze Age shepherds. Rare in their home territory and even rarer in North America, this ancient breed is truly worthy of conservation. We raise British Soay Sheep with full pedigrees traceable to Soay Sheep registered with the Rare Breeds Survival Trust in Great Britain. We maintain a large collection of British conservation flocks ► breeding stock which allows us to offer starter flocks with broad genetic diversity. What is a Soay sheep, anyway? Are you brand new to Soay sheep? Wondering where they came from, what the rams look About Soay Sheep ► like, what the ewes look like? What do they like to eat and how do they behave? Will I have to shear them or dock their tails? Intrigued? 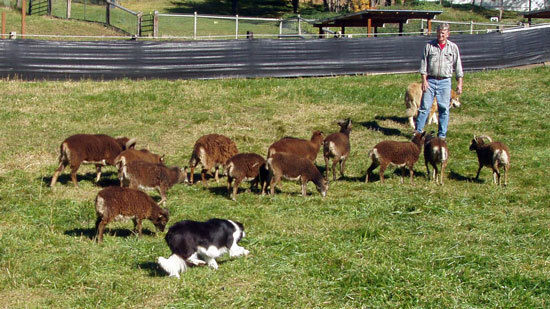 When setting out to acquire a flock of Soay Sheep, you have many options. How many? How big a starter flock? Are you interested in a purebred, full British flock, and helping to conserve the breed? Read more ► If you are not sure about breeding your own lambs, you might prefer to start with a non-breeding bachelor flock. Although we have managed to export British Soay Sheep to Canada in the past, as of this year, the process should be much easier. After seven years of comprehensive testing and monitoring, as of July 28, 2014 our farm finally is "Export Certified" by the USDA and therefore classified as a "Negligible Risk Premises" by the Canadian authorities. Contact us for further information.